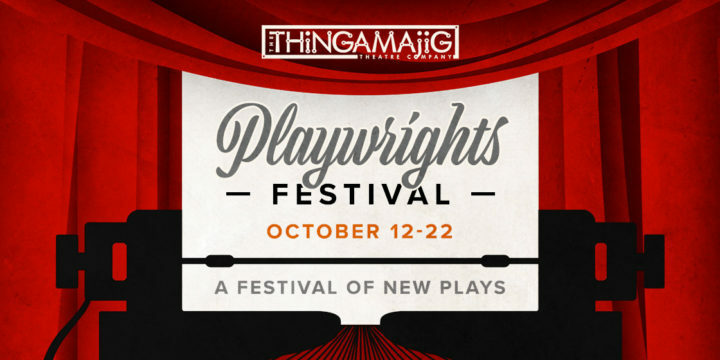 The Thingamajig Playwrights Festival pulls back the curtains from the playwriting process and gives you an inside look at how a play goes from ideas in a playwrights head to words on a page to action on the stage. To enjoy all the events in the festival, Festival Passes are available now! “box.” — a fully staged and produced one-man show — is the brainchild of Pagosa Springs favorite, Dennis Elkins. The show is an an autobiographical journey of cleaning house after loved ones die and when those of us who are left must choose what to keep and what to shred. The easy solution is to dump the stuff in a box and deal with it later — but, when “later” comes, we still agonize with the left-overs in a comical way. 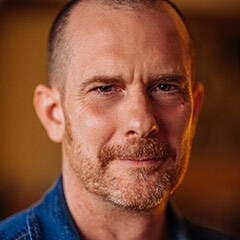 CLICK HERE to learn more about Dennis Elkins’ “box.” and to buy individual tickets. Sometimes part of being in a club is keeping other people out. *Those who have ever spent/considered spending Spring Break in Cancún need not apply. It’s the Friday before Homecoming in a suburban high school and a scandal emerges… Crystal Andersen has committed an unspeakable act with the Texas flag. In a culture where legacy and tradition often go unquestioned, one student changes the consciousness of her community. Jennifer Faletto’s plays include THE TEXAS HOMECOMING REVOLUTION of 1995, f/k/a BATHROOM HATE (2015 Reva Shiner Comedy Award finalist), DOMESTIC ANIMALS (2016 Woodward/Newman Drama Award finalist & 2016 O’Neill semifinalist) and THIS LITTLE LIGHT. Jennifer’s plays have been developed and produced at The Kennedy Center Page to Stage Festival, Venus Theatre Company, Amphibian Stage Productions, Palm Beach Dramaworks, Best Medicine Rep, The Blank, The Capital Fringe, The Great Plains Theatre Conference, Panndora’s Box, and Short + Sweet. Jennifer studied at the National Institute of Dramatic Art (NIDA) in Sydney, Australia and holds a BFA in theatre performance from TCU. She is also a graduate of the Second City Conservatory (Chicago). Coming up: November 3, 2018 – REINDEER CUPCAKES to have a reading as part of the Denver Center Theatre Company micro-theatre project. Plays include MARROW part of (IM)PULSE, Spectrum Dance/Seattle Rep, directed by Donald Byrd(3 Gypsy Rose Lee Theater Awards); WARREN, Boise Contemporary Theater; MAPPLETHORPE/The Opening, The Provincetown Playhouse, New Conservatory Theater Center, Sixth@Penn, and The Popop Studios, directed by John Stix. Developmental/readings: Playpenn, Seven Devils, Primary Stages, The Atlantic Theater, EST, Hudson Stage, Actors Studio, Dixon Place, Axial Theater, and Emerging Artists. Quirk is Weissberger nominated and the recipient of The Robert Chelsey award, the Erik A Takulan fellowship from Djerassi, a Leon Levy Foundation Grant, a John D. and Catherine T. MacArthur Foundation Grant from MacDowell, an Arch and Bruce Brown Foundation Grant and The Jane Camp Fellowship from the Virginia Center for the Creative Arts. A three-time MacDowell Colony Fellow, with residencies at Ucross and The Wurlitzer. Member of id theater’s writing group, a Dramatist Guild, and alum of the Actors Studio/ PDU and Project Y Playwrights group. 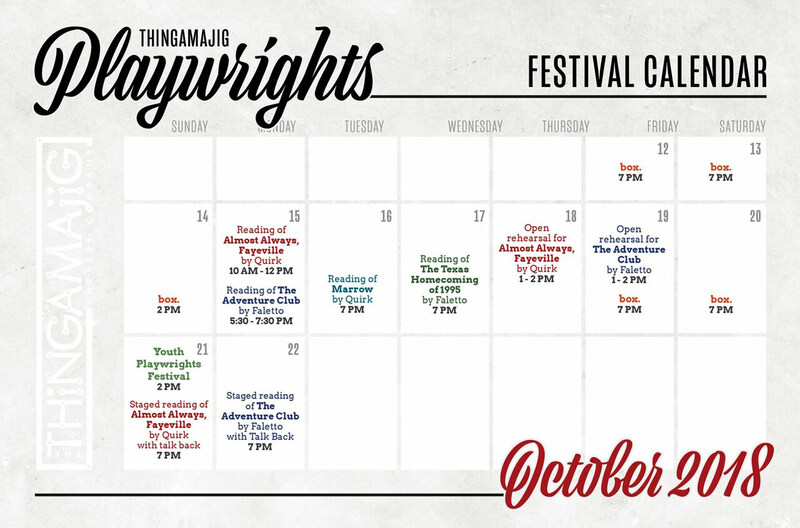 The Playwrights Festival runs from October 12 to October 22 with various events throughout the week. Festival passes are limited. 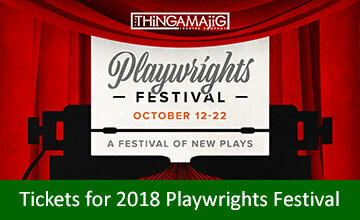 The full festival pass is $70 without a season ticket, and $50 when purchased with a Thingamajig Theatre Company 2018/2019 winter season ticket. For more information, call (970) 731-SHOW (7469).